What could be good about a bad marriage? The good news is, you can get beyond that old marriage and its destructive habits, and build a brand-new one with the same spouse. And you can do it in just 90 days, even if only one spouse is committed to change. Thousands of couples in marriages that are on the brink will never enter a therapist's office, and for others it's too late by the time they do agree to come. But for more than 20 years, David Clarke has seen marriages turn around in just 12 weeks. 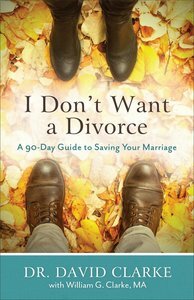 Here he takes his 90-day plan and presents it using humor, Scripture, and personal stories to help couples turn difficult marriages into great ones. Whether the issue is communication, the kids, negative attitudes, or even serious sin, Clarke's personalized approach will put readers on the road to a great marriage. About "I Don't Want a Divorce"